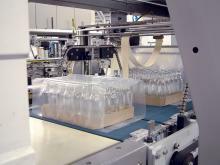 At PACK EXPO 2008, SMI will be exhibiting an SK 450T continuous motion tray/shrink packer. 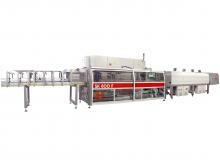 This machine can pack several kinds of containers (bottles, jars, cans, bricks, bundles, multipacks, cartons etc.) and materials (PET, glass, HDPE, aluminium etc) in film only, film and pad, film and tray and tray only, providing outputs up to 45 packs/min. SMI shrinkwrappers speed ranges from 18 to 360 packs/minute, depending on the model chosen as well as on the product specifications. The use of top-quality components and of a state-of-the-art technology makes SMI machines highly reliable and extremely flexible. 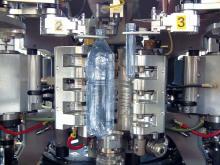 SMI also manufactures rotary stretch blow molders for PET, PEN and PP containers up to 36,000 bph. The SR series consists of standard models for the stretch-blow moulding of bottles from 0.25 to 3 litres and SR HC -High Capacity models for bottles from 3.5 to 10 litres. All models are equipped with an innovative air recovery system, which reduces the compressed air consumption up to 40%. In addition SMI supply air/belt conveyors and deals with the design and installation of complete packaging/bottling lines. We look forward to meeting you at our stand because Pack Expo 2008 will be the ideal occasion to discuss about our future developments, innovations, etc. Thanking you in advance for your kind attention, we remain.